In the Roman Rite, the term “vigilia – vigil” traditionally means a penitential day of preparation for a major feast. The Mass of a Saint’s vigil is celebrated after None, as are the Masses of the ferias of Lent or the Ember Days, and in violet vestments; however, the deacon and subdeacon do not wear folded chasubles, as they do in Lent, but the dalmatic and tunicle. The Mass has neither the Gloria nor the Creed, the Alleluja is simply omitted before the Gospel, not replaced with a Tract, and Benedicamus Domino is said at the end in place of Ite, missa est. Before the Tridentine reform, the vigil of a Saint consisted solely of the Mass, and had no presence in either the Roman version of the Divine Office, or in that of most other Uses. A minority custom, which seems to have been predominantly German, gave an Office to the vigils of Saints, which consisted of a homily at Matins, and the use of the collect of the vigil as the principal collect of the day; the rest of the Office was that of the feria. 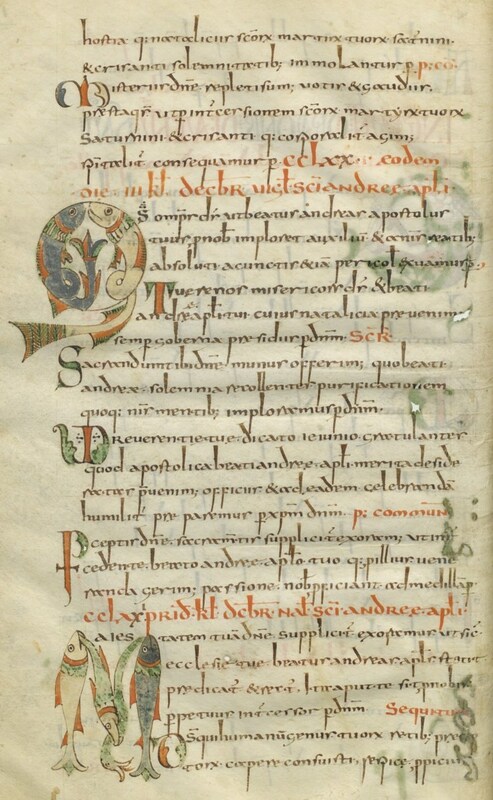 The Breviary of St Pius V adopted this latter custom for the vigils of Saints, a rare example of change in an otherwise extremely conservative reform; but even for the Roman Rite, this was not an absolute novelty. Historically, the vigils of the major feasts of the Lord (Christmas, Epiphany etc.) did include the Office, and the change in 1568 simply extended the scope of a well-established custom. Writing in the mid-12th century, the liturgical commentator John Beleth states that the feast of St Andrew the Apostle “has no vigil, because it occurs in a time of fasting, (i.e. Advent), wherefore it was not necessary that a vigil be instituted for it.” (Summa de Ecclesiasticis Officiis 164). At the end of the 13th century, William Durandus repeats this statement word for word (Rationale 7,38). It may safely be assumed that this is not said merely in error, and does reflect a custom which they both knew to be in use at the time. 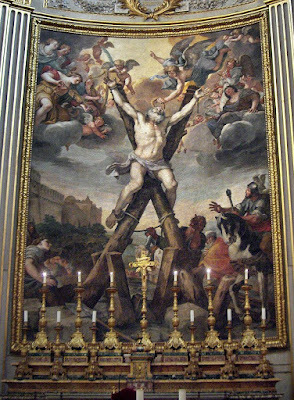 Nevertheless, the vigil of St Andrew is a very ancient observance of the Roman Rite, attested in the oldest sacramentaries and lectionaries with its own proper Mass, alongside those of the Assumption, the Birth of St John the Baptist, Ss Peter and Paul, and St Lawrence. Prov. 10, 6a The blessing of the Lord is upon the head of the just, Sir. 44, 26 therefore he gave him an inheritance, and divided him his portion among the twelve tribes, 27 and he found grace in the sight of all flesh, 45, 2 and magnified him in the fear of his enemies, and with his words he made prodigies to cease. 3 He glorified him in the sight of kings, and gave him commandments before his people, and showed him his glory. 4 He sanctified him in his faith, and meekness, and chose him out of all flesh. 6 And he gave him commandments before his face, and a law of life and instruction, and 7 exalted him. 8 He made an everlasting covenant with him, and he girded him about with a robe of justice, and the Lord put on him a crown of glory. The Crucifixion of St Andrew, by Mattia Preti, from the choir of the basilica of Sant’Andrea della Valle in Rome. 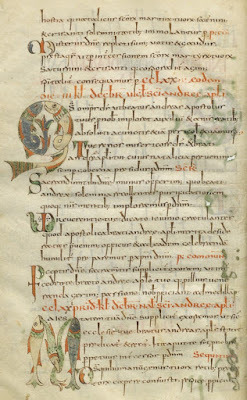 In the year 1955, as part of a simplification of the rubrics of both Missal and Breviary (which was in reality anything but a simplification), the vigil of St Andrew was suppressed, although the similarly ancient vigils listed above were not. Since the Gospel passage occurs nowhere else in the Missal, in 1960, it was rescued, along with the Introit, as part of a newly created votive Mass “to ask for ecclesiastical vocations”; the Epistle and the Communion, however, have disappeared. In the post-Conciliar rite, in which vigils in the traditional sense do not exist, both the Introit and Communion from the vigil of St Andrew have been moved to his feast. According to the rubrics of the Breviary and Missal of St Pius V, if the vigil occurs in Advent, the Office is that of the ferial day of Advent, with no mention of the vigil. However, the Mass of the vigil remains the principle Mass of the day, with commemorations of the feria and the martyr St Saturninus.